Just in time for Halloween, Halifax Magazine explores Halifax's spookiest spaces. Katie Ingram delves into the stories of the ghosts that supposedly haunt this city. 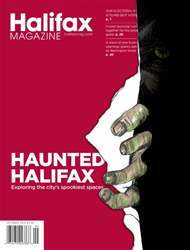 Also in this issue, we explore Halifax's ties to India, wine columnist Danny Hewitt visits Italy, and we explore Barrington Street's revival. In our opinionated back-page column, Ryan Van Horne looks at the sad story of Shelley Connors, and questions why it's taken police so long to solve her murder.